David Craig, senior lecturer in Sociology at the University of Auckland, has has written an interesting piece about the state subsidising wages. Essentially he describes how the 1980s economic reforms left NZ a low wage economy which both National and then Labour addressed through wage and rent subsidies. Some of the policies he identifies are less obvious than others. There can be no doubt that it is near impossible to live alone on the minimum wage. And that low wages drive people off shore. New Zealand needs higher wages. But when the state steps in with tax credit top-ups and accommodation subsidies the pressure on employers to lift wages or landlords to lower rents is reduced. Ironically it is largely the left that create these subsidy policies. They worry over rising inequality but inadvertently enable it to grow because their redistributive policies play back into the hands of those who own most of the wealth. Tax credits have been proven to be the only way to get vast numbers of ex-beneficiaries in the US into work and earning enough to live on. In the short term I support them because having a parent in work will provide the best chance of breaking into the inter-generational state dependence cycle. But will their children also have to rely on top-ups as a permanent state of affairs? I want to see a more egalitarian society. But I don't support the state being the instrument by which that is achieved. Neither however do I think the unfettered market will achieve it. I base that on human nature and the reality of greed. I gather Craig supports the state as that instrument but is in a quandary as to how incomes can be lifted and inequality stemmed continuing on the current pathway. So where do statists go from here? 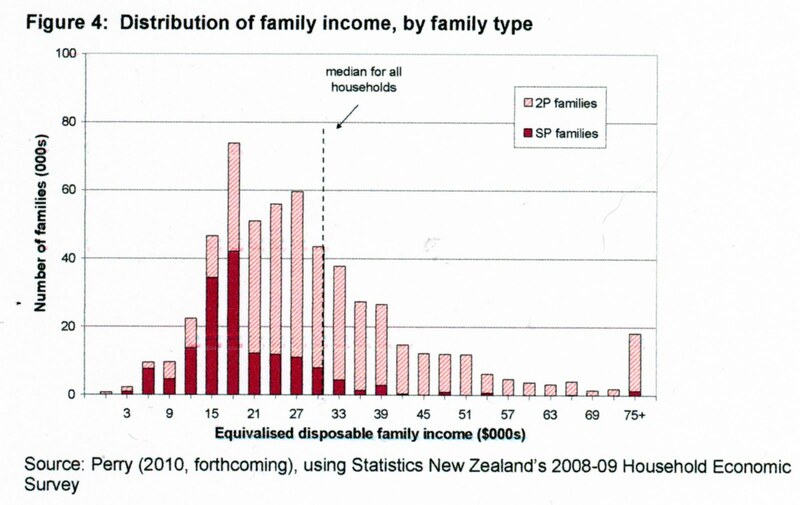 Longer term strategies such as a Universal Basic Income or at least some universal provision for children were well supported in order to simplify the system and remove the judgmental attitudes often attached to all benefits other than New Zealand Superannuation. 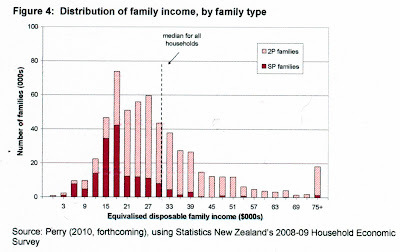 A UBI requires high tax rates in order that every adult New Zealander receives a basic income from the state. This replaces the current benefit system. I would never support it despite some libertarians having mooted the idea from time to time (of recent times, notably Charles Murray). Briefly, it would badly affect entrepreneurship and productivity and it continues the 'paying people to do nothing' syndrome. It's a dangerous idea that could, however, easily gain widespread currency in a relatively poor country like NZ. There was a realistic understanding about the costs of change at both the ideological and the practical levels. The visions of a compassionate and respectful agency which supported people to towards meaningful work were supported, alongside a call for immediate changes. These included extending Working for Families to all families and restoring benefit rates to pre-1991 levels; restoring the discretionary Special Benefit for people who cannot meet their essential financial commitments; and creating some real jobs appropriate for the diversity of people who need them. I couldn't agree that these proposals do reflect a "real understanding". Even Labour refused to extend the In Work tax credit to beneficiary families and were backed by the Human Rights Tribunal in that action. There is nothing new being proposed by the shadow group. It's simply an organised front for advocating greater state involvement in the redistribution of wealth. Their goals are short-sighted and would be implemented to the detriment of all New Zealanders over the long term. As a nationality the French are a puzzle. On one hand they can get off their backsides to protest en masse. But on the other, what are they squealing about? Not being able to sit on their backsides from age 60. Oh, but really. They aren't lazy. They are magnanimous. Francois Courton, 80, a retired manager from the Paris city roads department, said that he was there "for the younger people". "If people don't retire at 60, where are the jobs for the young to come from?" The same place they come from in all the other countries with higher retirement ages. The statutory retirement age in Germany is 65. Recent reforms will increase the retirement age to 67 by 2029. With a slightly more favourable demographic development than the EU as a whole, the statutory retirement age is set at 65 for men and 60 for women. Current reforms have slated a new retirement age for women from 60 to 65 by 2020 and 68 for both sexes by 2046. Spain faces one of world’s most severe demographic challenges, with almost one in three Spaniards over 65 by 2049, according to government estimates. The retirement age is currently 65 for both men and women. While early retirement is possible at 60, pension payments are substantially reduced in this case. The ruling Socialist government has adopted legislation to raise the retirement age to 67, with the reform to be introduced gradually from 2013. The retirement age in the Netherlands is 65. The Dutch government has decided to raise it gradually to 67 by 2025. Italy’s current retirement age is 65 for men and 60 for women, but since the length of contribution also counts, actual exit ages can be considerably lower. Legislation adopted in 2007 marks the minimum retirement age at 60 in 2011 and 61 in 2013. According to the Organisation for Economic Cooperation and Development (OECD), public pension expenditure will increase to almost 25 percent of Italian GDP by 2050, about twice as high as the value projected for the EU. The retirement age is 65 for men and 62 for women, but under significant pressure from the Eurozone group, Greece’s Socialist government has introduced changes to its pensions system to curb massive debt. The retirement age for women will rise to 65 to match that of men, but women and men will still be able to retire earlier provided they have worked at least 37 years. French lawmakers have cited Sweden’s 1994 pension legislation as a model for future changes to its own system. Under Sweden’s reforms, which split retirement plans between private and public schemes, the minimum pension age is set at 61 for both men and women, with no maximum retirement age. Coming from a family on welfare benefits increased the risk of ADHD medication by 135 per cent when compared with households not claiming benefits. As usual there are inter-related factors - low maternal education, single parenthood and low income. "Our study showed that almost half of the cases could be explained by the socioeconomic factors included in our analysis, clearly demonstrating that these are potent predictors of ADHD-medication in Swedish schoolchildren" says Professor Hjern. "There are several ways that family factors may influence ADHD. For example, low parental education is associated with general social disadvantage, a higher number of stress factors and a greater risk of childhood adversity. Parents of children prescribed methylphenidate for ADHD were selling it to supplement their benefit, while there was anecdotal evidence children had been selling it at school, Dr Morgan said. The National Addiction Centre director and psychiatrist, Associate Professor Doug Sellman, said the more methylphenidate was used for ADHD, the more families would trade it. "The temptation to sell Johnny's medication is stronger in poorer families, and ADHD tends to be found more in lower socioeconomic families," he said. So I guess there may be a question about whether the condition and diagnosis is more prevalent amongst beneficiary adults and children, or the desire for the medication. Probably a combination of both. 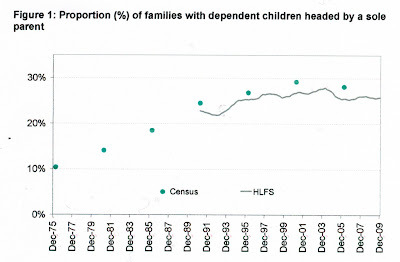 The following graphs paint a clear picture of the deprivation associated with sole parenthood. The natural reaction to this is concern. Especially as these circumstances affect not just the parent but the child living with the parent. The response of the left is to call for more money to be diverted from two parent families into one parent families. 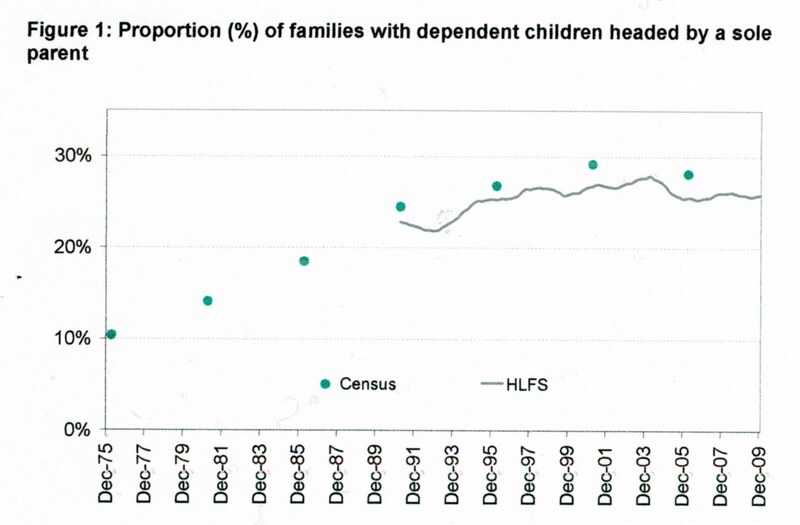 This ignores the likelihood that in doing so more sole parent families will be created. 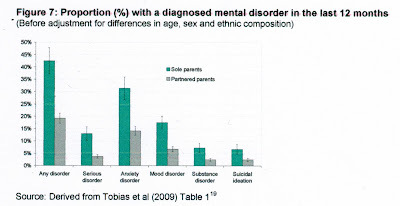 In any event a well-known Swedish study into a huge cohort of relatively advantaged (in comparison to other countries) sole parents in that country showed that their children still suffered higher rates of mental illness, suicidal ideation, drug addiction etc which suggests the parents were similarly afflicted. Of course there is something of the 'chicken and egg' scenario occurring. 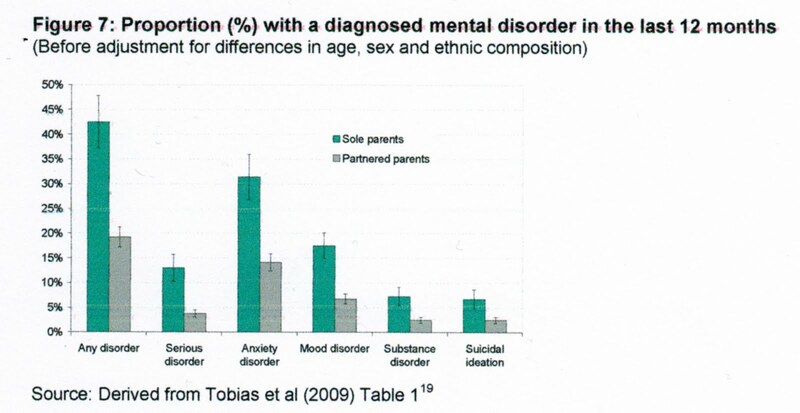 Does a mental disorder predispose to sole parenthood or does sole parenthood make mental illness more likely? I believe it is at least safe to say that an existing mental disorder will generally be exacerbated by becoming a sole parent. So are we between a rock and a hard place with sole parents? Is the only way to reverse the trend a withdrawal of the subsidy? And isn't that unthinkable? But the subsidy shouldn't be removed over night or in totality. In practice that means time-limits and exemptions. It certainly must not be increased. And as well as mental illness requiring more medical intervention, there are other safeguards - having work and a partner. An over-simplified analysis? Quite probably. But sometimes we just get bogged down in detail and paralysed by the parameters and politics of the problem. This farm is run by the Corrections Inmate Employment (CIE) scheme,and in three years is footing it with any well-run dairy farm, evident from its two milk-quality awards from Fonterra last season. The farm is run as a commercial venture and also as a training facility for prisoners before release. In conjunction with daily farm work, inmates are offered training through the Agriculture Industry Training Organisation. Last season 75 prisoners gained 283 unit standards in a variety of courses. For some these were their first qualifications. The credits were earned for courses as diverse as animal health, animal handling, chainsaw safety, Grow Safe and tractor and all-terrain vehicle driving. "For some, it is the first time they have passed something in their life. To them it's very meaningful. It lifts their self-esteem." For many, it was the first time they had worked with large animals, which could be intimidating as well as rewarding. "The thing about animals is that they don't argue, condemn or criticise," Mr Gorton said. I am never able to fall into one or other camp when it comes to crime and punishment. Prisons are essentially places that make most who go there more likely to re-offend. Yet sending them there is often unavoidable. So why don't we do more of this sort of stuff? I can see a strong libertarian argument that objects to using taxpayer money to create competition with other tax-paying farms. But if the primary role of the state is to maintain law and order doesn't rehabilitation take a higher priority? I am reminded of a recent conversation I had with a man who did a spray painting apprenticeship in prison. By sheer chance he got the opportunity to demonstrate his proficiency with a potential employee. He told me how he had stepped into the booth, done all the right things bar neglecting to don the mask of the usual worker. He was stopped and asked if he had heard of OSH? To which he replied, "Listen. I've just come out of jail. I've got me a clean bill of health. No hep. No HIV." Of which he was evidently very proud. "You think I'm putting that germ-riddled thing on, your mad." Suffice to say, he got the job.